In 1942, Van Heusen, along with Johnny Burke, was in Palm Springs working on the score for a film. The comedian Phil Silvers dropped by and suggested that they write a song for Van Heusen’s wife Bessie, whose birthday they would be celebrating soon. “Bessie, with the laughing face” was well-received and the pair would often sing it at birthday celebrations for other women. A bit later, at the birthday for Sinatra’s daughter Nancy, they sang the song again, this time using “Nancy, with the laughing face.” Sinatra was quite moved, thinking that the song had been written especially for him and his daughter and the songwriters let him think that. Frank Sinatra first recorded “Nancy” in 1944. 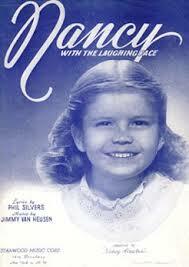 “Nancy” was recorded in June 1992 and was released that year on Perfectly Frank. It was arranged by Ralph Sharon.